awareness-raising among consumers about energy conservation. Fully committed to maintaining this path, the capital of the Vaud canton launched its Display™ Campaign in October of 2005. Aim _ To encourage the local authority of Lausanne to display energy consumption figures in its public buildings. One of the objectives of the Industrial Services of Lausanne (SIL - the municipal works) is to raise awareness about energy conservation among consumers. Key points - Completed in June 2006, the first phase of the Display™ communication campaign addressed the citizens of tomorrow. At this moment, some 2,240 children in elementary school, junior high, and some high schools have been involved. 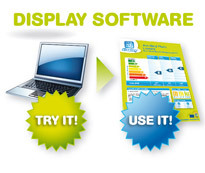 Display™ is presented in a simple fashion so that the pupils understand what is at stake, what their impact is on the environment in their daily lives, and what information is displayed. In class, a presentation of Display™ takes about one hour. The Display™ presenter and coordinator uses simple tools of communication. The presentation begins with a DVD movie called "Living with energy" produced by the Polytechnical School of Zurich; there are also posters explaining the situation in Lausanne and the situation in that particular school building in addition to a display explaining the greenhouse effect and the official Display™ poster. Then there are specific demonstrations: solar panels connected to a light bulb and an electric motor, a demonstration of water aerator taps and a portable photovoltaic panel. The presenter and coordinator of Display™ tailors the language used and the quantity of information provided in the presentation to the level of the pupils without oversimplifying the message. Pupils are invited to take part; pedagogical activities encourage the children to contribute to energy conservation. - The schoolchildren think about how they can change their behaviour in order to consume energy more intelligently; they also get involved in a project, such as a competition to improve energy efficiency in their school. The first thing done in each class is that all the children sign a charter indicating their commitment. Each week, another pupil becomes responsible for energy: it is that pupil’s job to make sure that the charter is respected and that the other schoolchildren behave responsibly in terms of ecology. But grownups are not left out either. Lausanne is also publicizing the Display™ campaign in buses and at exhibitions devoted to energy efficiency, especially those held at the doors of the Canton Court of Montbenon. Reason for inclusion as Shining Example Lausanne, an ecological pioneer, is known for its commitment to and the efficiency of its Display™ communication campaign, which is currently being conducted in schools to raise awareness among 13,000 future citizens over the course of three years. There’s hope that other towns will follow this example! The total funding provided by the city in 2005 is estimated at 120,000 CHF (76,120 €), 80,000 CHF (50,743 €) of which stems from loans from the city - in other words, work done by city officials - with the other 40,000 CHF (25,372 €) devoted to the displays themselves, wages for students hired in the summer to make certain calculations (such as the floor space in community buildings), and salaries for the presenter / coordinator of the Display™ campaign. It is worth noting that Lausanne provided this funding for the Display™ communication campaign from its normal budget. Benefits The Display™ Campaign is attracting great interest among school caretakers, some of whom have decided to take part in energy conservation within the Display™ Campaign in the next school year. For them, Display™ is an aid that makes the work they do in their building visible. Achievements Each year, the presenter summarises the results of the Display™ Campaign. In addition, from September 2006 to January 2007 Lausanne will be following the example set by the children who participated in Display™. Currently, the city is preparing a Franco-Swiss educational programme called Energie EDEN that will be financed by Interreg III. The goal is to produce an educational campaign on energy with regular monitoring and a specific approach that is clearly defined (controlling fire, energy rallies, an energy observatory) and scientific in nature that will be held within the school and supported by professional educators. Experience and educational approaches will be shared and pedagogical tools created jointly between France and Switzerland. The project will begin in four pilot classes in two schools in Lausanne. Furthermore, a building renovation programme will accompany the campaign for three years (2005-2009) to reduce energy consumption with around 5%. Lausanne will be displaying the double poster "before/after renovation" to show the effects of the work undertaken in the buildings if the building moves up a class. This double poster will be updated every year. The first Display™ campaign will be completed at the end of the 2005-2006 school year. Additional awareness-raising events will also be taking place in the next three years to reinforce the sense of responsibility among the future citizens of Lausanne - 13,000 children. A CD-ROM project is also underway. This CD will provide teachers with material they can use to continue the Display™ Campaign and educate pupils about energy.